Surfing Facebook has become a daily habit of the internet population. Facebook now has a valuation of $80 billion, and it positioned second to the search engine giant Google, in terms of the traffic statics. As per the latest studies, an average Facebook visitor spends at least 10-45 minutes on the site for their social activities. Facebook has released native mobile applications for iOS (iPhone, iPod Touch, iPad), Android, Windows phone, Symbian( Nokia) and other smartphone platforms. They also have tie-up with mobile network providers for SMS/ free user access to Facebook mobile portal. All this accounted for tremendous growth of Facebook usage on mobile as well as desktop computers. 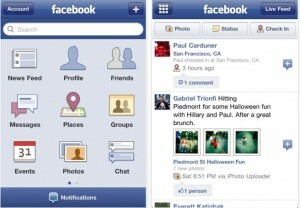 Are you looking for a Facebook client for your mobile device? Have a look at our list of the official apps for different operating systems. Sync Facebook profile photo to phone and set as caller ID for contacts. More details on this feature is given at Winytips. Facebook places: Check-in at different places and update the stats using the phone GPS functionality. Update Facebook with text, photos or by recording a video. Read news feed of Friends update. Chat with online Facebook contacts. Personal inbox to check direct messages and offline chat entries. Special tabs for checking Group activities, profile data and friends list. Download the Facebook Mobile for iOS here. Download Facebook Mobile for Android, here. In case your mobile is not in the supported list, still you can access the Facebook mobile at m.Facebook.com on your web browser. It is pretty fast and takes less data charges. funy..I;ve search for the name of your email and it shows up named under mario cuevas, not vasquez… is this real or just any other scum? does it works for LG KG200? ?